Mr. Joey began his Martial Arts career at the ripe old age of six, in 2003. 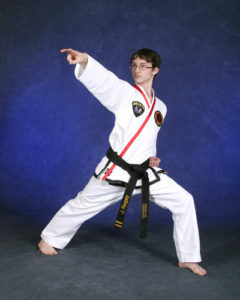 He began training in the art of Taekwondo under Mr. Nickolas Zapton. He was awarded his very first advancement, to Yellow Belt, on his seventh birthday. He received his 1st Degree Decided Black Belt in December of 2005. He immediately began working to obtain his Junior Assistant Instructor Certification which he achieved in February of 2008 making him one of the youngest to ever reach that achievement. In August of 2008, he also became one of the youngest in CTF history to earn a 2nd Degree Decided Black Belt. He was awarded the Donelson TKD Male Competitor of the Year at the 2007 Donelson TKD’s annual Christmas Banquet and Year-end Awards Ceremony. After being a part of the After-School and Summer Camp Programs at Donelson TKD for many years, in 2011, Mr. Zapton officially added him to the staff as a helper in those programs as well as an evening class instructor. In April of 2012, he became one of the youngest ever 3rd degree black belts in CTF history, just weeks before his 16th birthday. In the CTF, at this age you cannot become a full 3rd Degree Decided Black Belt, you must be an adult to receive this rank. Therefore, for students like Mr. Joey that train so many years and advance so soon, they created the rank of 3rd Degree Recommended Black Belt. According to CTF records, only 4 other students that received this honor were younger than Mr. Joey at the time of achieving it. In the summer of 2013, he joined his Dad as an assistant instructor at the Cool Springs YMCA’s martial arts program until it closed later that year. On September 14th 2014, Mr. Joey tested for and achieved his full 3rd Degree Decided Black Belt. Mr. Joey is currently attending the University of Tennessee Knoxville majoring in Physics and Minoring in Education. He plans to begin Teaching High school while he pursues a Masters and then Doctorate in Physics. He is continuing his training with Mr. Matt Shae from time to time.